After your budget has been completed and approved, Figured gives you the option to create your forecasts using the figures you entered into your budget as a starting point. You need to copy your budget to the forecasts in your planning tab and in each of your production trackers. Once you’ve approved your budget, click the Copy budget to forecast button as shown below. A new window will appear, adjust the drop down boxes to suit and then click on Copy. If you have any existing data in your forecasts view, the copied across budget numbers will add onto these which could cause doubling up of data. If you do not wish to have this happen, ensure you select Delete existing. NOTE: When working in a multi farm you will also need to choose the farm you're working in from the drop down menu. It's important to remember that everything to do with production occurs within the individual trackers, including copying the budget to forecast. 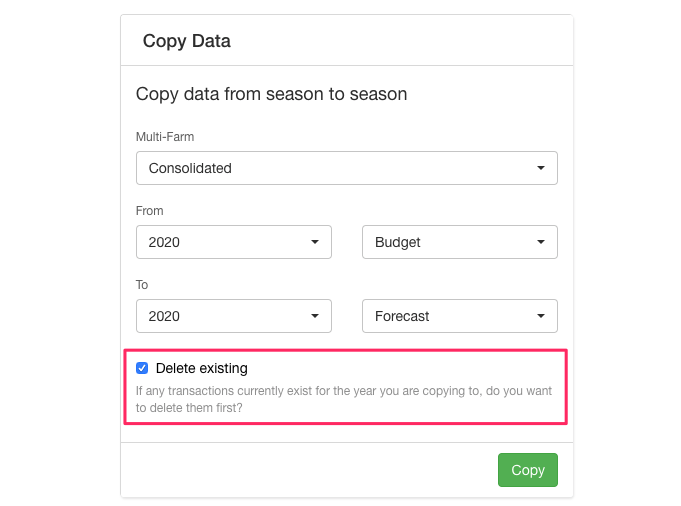 To copy your Budget to Forecast for your trackers, go into each tracker and then click on Tools > Copy Budget to Forecast, or if in your Milk Tracker, click Copy Budget.